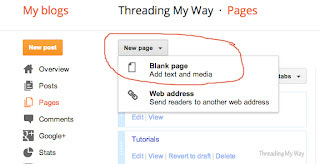 After posting the Sewing Tutorials link party, a couple of readers new to blogging, contacted me asking how to create a tutorials page. 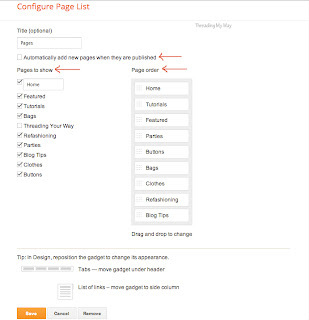 Today's tutorial will show you how to add a Tutorials page to your Blogger blog. Having a test blog enables you to make mistakes that don't matter!!! 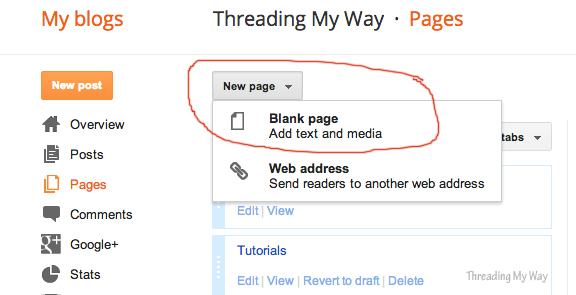 Work on your new page, just as if you were creating a regular post. To keep it in Draft mode, just Save and don't publish. No one will see your page until you publish. In the example above, you can see Tutorials... circled. This is a page I created just to show you how it's done. My actual Tutorials page is on the left. 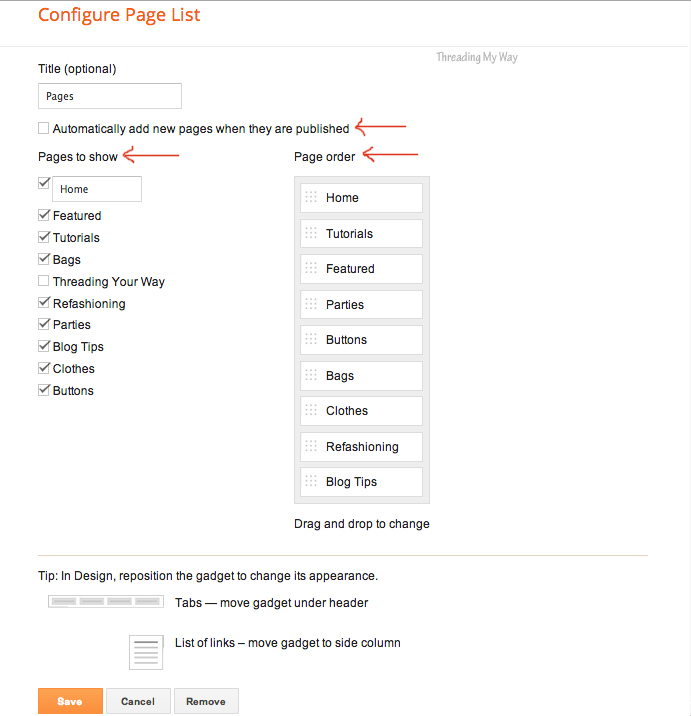 Once you have finished your page and are ready to publish, decide whether you want your Tutorials page to be displayed at the top of your blog, or in your sidebar. Go back to your Tutorials page and Publish. That's it... you have created a Tutorials page. This is how it looks at the top of my blog. Pages do not show as regular posts. They are not dated and are accessed by clicking on a tab up the top of your blog or in your sidebar. You can alter this at a later date. You can choose which pages to display and the order in which you want them to appear. In this day and age, people expect things to be quick and easily accessible. If they have to search for it, chances are... they won't. Now that you've created your tutorials page, your readers will know straight away where all your tutorials are. 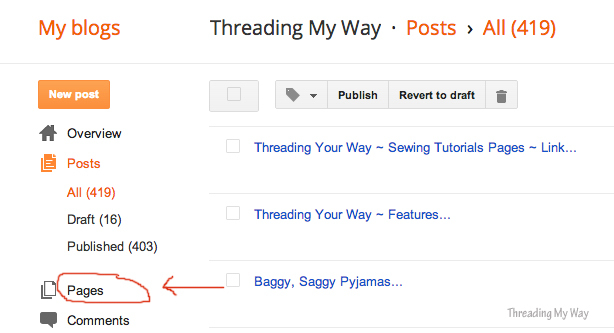 Don't forget, if you have a Sewing Tutorials page, add it to the Sewing Tutorials link party. You can find more tips to help with your blog in the series... How Does Your Blog Look. Thanks so much Pam for this great tutorial. While I have created pages at the top of my blog, I did it differently and didn't know the way you showed, which looks easier. I learn so much from you! Thank you so much Pam! Your tips are great! Thanks, great info! I have been thinking about making a tutorial, but I'm just not sure it's worth my time. ^^^ Yes - what Daryl said!!! Pinning this for future reference! 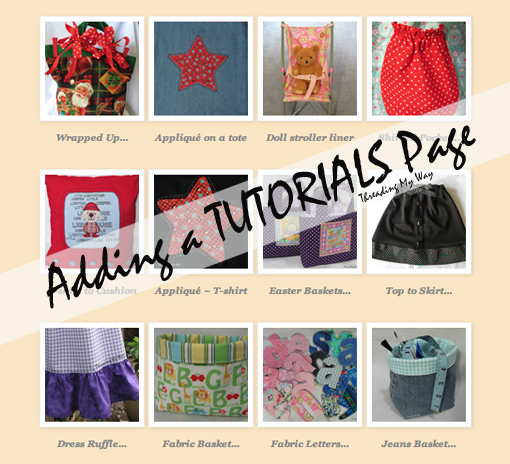 Thanks so much, Pam, for this great tutorial on making a tutorials page! Believe me, I need all the help I can get. You're a doll for sharing your knowledge and ideas with us. Yes, you are right, I need to create a tutorial page. I've put it off because I thought it would take time to search out all of my tutorials. Then I had a light bulb idea this morning I thought I'd share as a TIP for your post. 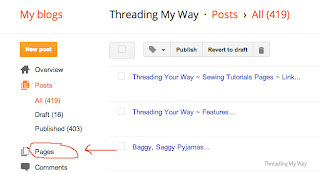 To quickly find a list of your tutorials go to your "Posts" page in Blogger and in the upper right corner type "tutorial" in the search box. Even when I didn't use the word "tutorial" in the title, I most likely used it somewhere in the post, and it's included in the list. I won't claim this is an exhaustive list, but it could be? Great tutorial Pam - lovely and clear with those screenshots! Great tutorial! Thanks for sharing at Real Family Fun. Great idea to share you knowledge Pam, thank you. Thanks for linking up to Thriving on Thursdays. The lovely Marissa from Raegun Ramblings has chosen this post to be featured tomorrow. Great to always have you linking up. This is such a great tutorial...Pinned it! I'd love for you to share this at The Project Stash (a 4 blog link party) that opens up at 8:00 pm eastern time tonight. thanks for the great tutorial. I am still having a problem getting my photos to be clickable so they are the link to my tutorial instead of having to have a title which is the link. Any suggestions would be gratefully received. Sorry for the late reply, Julie. Just had a look at your Tutorials page and it looks like you've worked out how to make the images clickable...ie; click on the picture, click on Link to unlink it, click on Link again and add the address of where you want the picture to link to. You can then delete the text if you wish, or can add a link to the text as well by highlighting the text, click on Link and add the address. Hope this makes sense.